Tadeusz Kantor’s theatre is probably best remembered for his insistent personal presence, on stage, and for the insistent coupling of his actors with an imposing multitude of “poor” wooden objects, dadaistic “machines,” and surreal contraptions, fused in the performance of memory and history. On both fronts, the 1985 “revue” Let the Artists Die! (Niech sczezną artyści!) stands out as extreme, and hence prototypical of Kantor’s oeuvre: “One of the most complex and self-referential” of his creations, and his “last acknowledged masterpiece,” as Noel Witts suggests, it is even more “dependent on the interaction of performer and object” than his previous works, and presents us with at least five different stage figures partly identifiable as its author.1 Meanwhile, Artists finds Kantor’s career at a very different level of establishment than was Grotowski’s, at the time of Akropolis: given his prior success with The Dead Class (Umarła klasa, 1975) and Wielopole, Wielopole (1980), the piece was an international coproduction, to begin with, and premiered in Nuremberg under the auspices of banker/patron Karl Gerhardt Schmidt. Rehearsed, on and off, for three years, and performed, worldwide, for five, it was preceded by three decades of work centered on Kantor’s “Cricot 2” theatre (the last two, with much the same core group) and a host of artistic “stages” and manifestos—though, at the time, most would only recognize this latest phase as the “Theatre of Death,” Artists, as concluding something of a trilogy begun with his definitive breakthrough with The Dead Class. 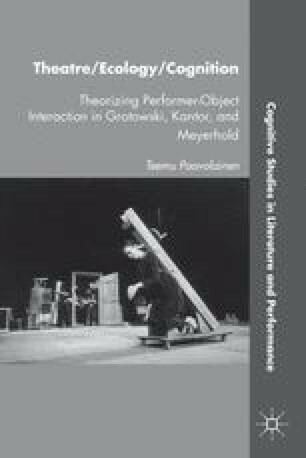 Finally, the establishment of the “Cricoteka” archives in Kraków ensures that the documentation of Kantor’s later work, in rehearsal and on tour, exceeds by far what remains of early Grotowski.